We are pleased to be able to introduce our laboratory.publiciota.com section to the public. As we have already announced several times, we also present a first small live tool. 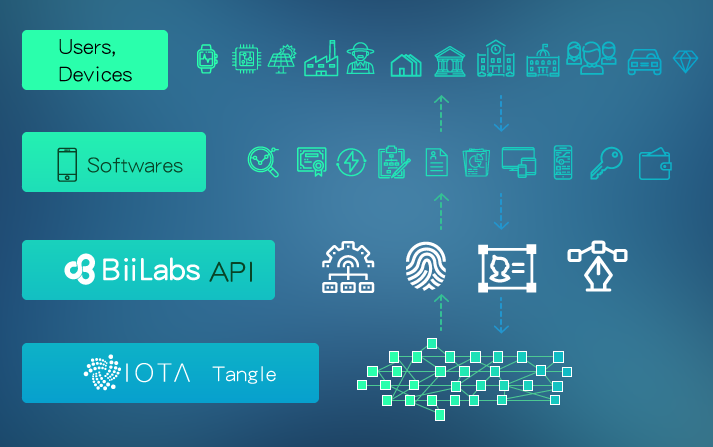 With our Lab we want soon to show a small selection of possible application and thus inspire many people and companies to integrate applications of IOTA and the Tangle. 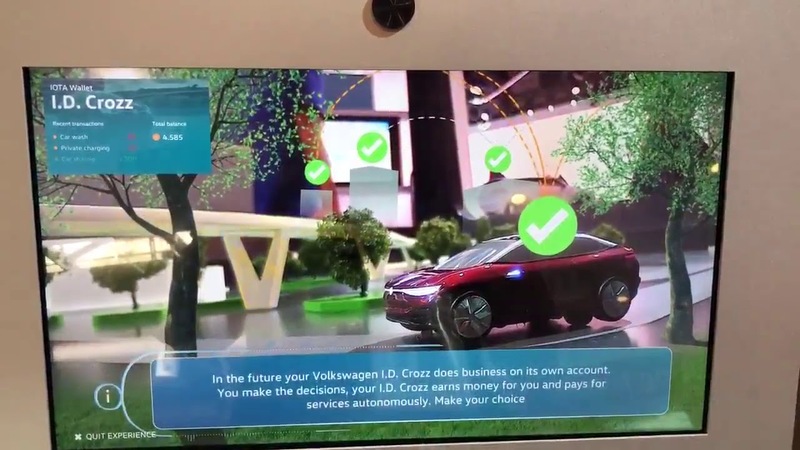 It does not just have to be on a large scale such as at VW, Bosch or Fujitsu. The variety of future applications, including smaller ones, will be of great benefit to the population. IOTA, too, will profit as well — more people will know about IOTA. Please excuse that many things are still a bit bumpy and unpolished. This is simply due to our limited financial resources, meaning that not everything could be implemented as planned. We also apologize if something does not work completely. However, our test runs showed that it continuously worked well. Despite these bumps, we have now decided to not wait any longer and present the tool in this first version. We will continue work on improvements, and as soon as the little tool has been optimized we will of course provide the code on Github. We will also present further applications in the future. After demonstrating the speed and data transferability in our first application, we will soon demonstrate the automatic reading of measurement data with a new live application as well as their transmission through the Tangle and the automatic triggering of further processes including the payment process. The Bosch XDK will also play an important role. 1.) Speed: The confirmation time of a transaction is anti-proportional to the number of transactions in the network (Tangle). The faster the transaction is confirmed the more transactions are carried out in Tangle. In our tool, this is illustrated by the “tachometer”, which measures the time of an unconfirmed payment. 2.) No transaction costs (suitable for micro payments): Due to the omission of miners, neither new monetary units nor transaction fees must be removed from the system, meaning that IOTA can work completely without transaction fees. You do not have to pay any additional fees for your payment and in our tool, small or larger payments are also 1:1, preventing “bank charges” to reduce the amount. Very important: It does not matter where in the world the payment is made from. 3.) Data transfer with the Tangle: Data can be mapped in the Tangle. In IOTA, a transaction can contain about 1.2 kilobytes of data. This means that IOTA can be used for secure data transfer. These data samples can then be retrieved again and further processed elsewhere. In addition to the payment, the name, the transaction sum and the transaction time are displayed by the Tangle in our tool. As small and simple as this tool is knitted, there is great potential for real-life applications. For example, this tool can be used to monetize various digital content on a website that have to do with data transfer. This is possible without the expensive integration costs, which many other tools require. The interesting thing is that the time from the payment process to the provisional confirmation is very short. Furthermore, this tool could be used as a donation tool — just like it is in our case. The story of the animation is quickly told. The power grid needs to respond very quickly to the fluctuating supply of power, for instance, by switching to renewable energy. Solar power and wind energy are available as input variables in this small tool. As soon as electricity is generated via the solar cell, it will be delivered to the power grid. In the future, the solar cell could be quickly and directly remunerated from the power grid via IOTA transfers. The necessary data are passed on with the Tangle. The same is also conceivable for the wind turbine and the wind energy fed into the grid. 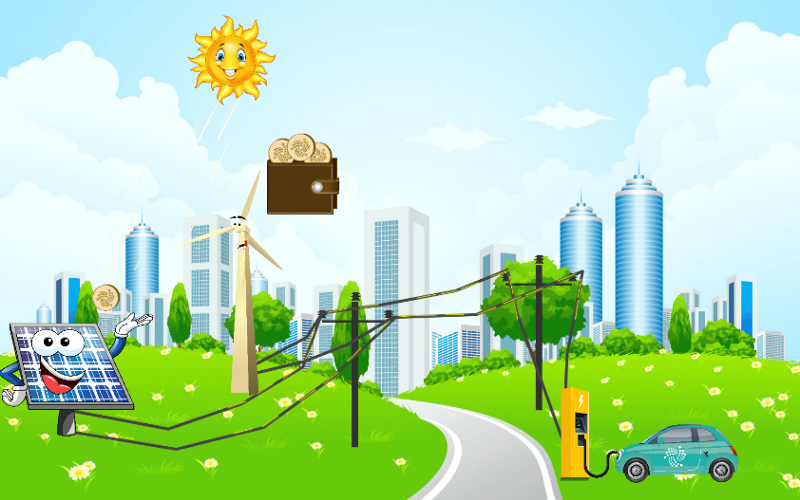 In our little animation, the power grid supplies an electric filling station with electricity. This happens automatically via the machine communication and the exchange of data. In this case, the electricity network will also be paid back with an IOTA transfer from the electric filling station. 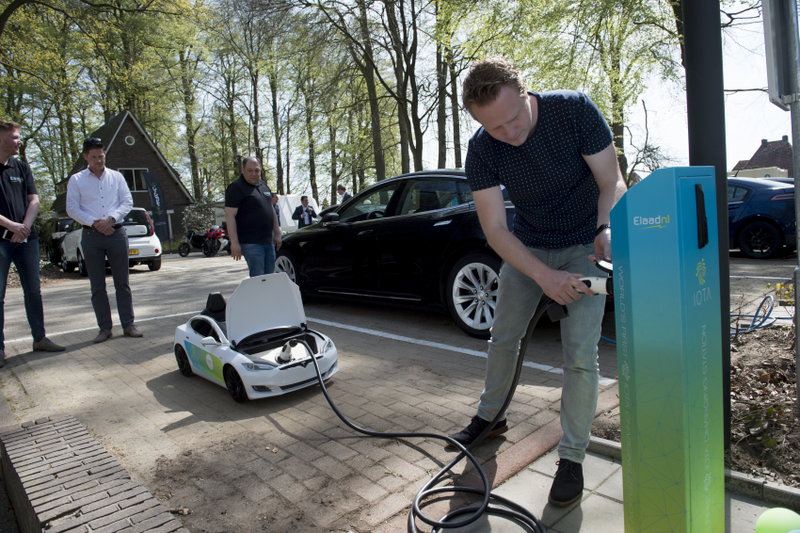 Finally, “Pubio” our autonomous electric vehicle comes Overnight or when parked in a car park, it automatically connects to an electric filling station and charges. The IOTA wallet built into the vehicle is also used for this data and financial transfer. Fully refueled, “Pubio” can cheerfully make another trip. We sincerely hope that you like this new area and that you support us broadly in our plan to illustrate the benefits of IOTA and Tangles. The link below leads to a chronological list contains references to original sources of known industry partners, official cooperations of the IOTA Foundation (IF), industrial showcases or proof-of-concepts as well as known contacts to corporate representatives, institutions and government bodies. The list currently contains 93 unique entities followed by a list of 69 known participants (list) of the IOTA Data Marketplace and 23 universities(list) with major and minor relations to the IF. The World Cup 18 is for many people the event of the year. Now you can also bet on the results with IOTA. 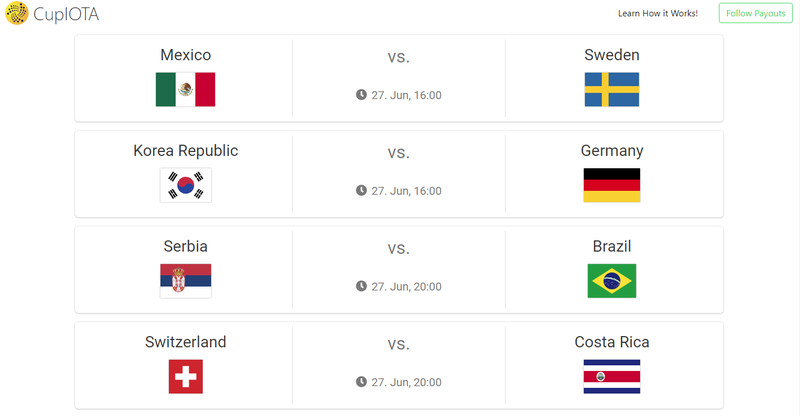 The FIFA World Cup 18 competition platform https://cupiota.com has just been completed. The operators saw this as a natural application for the tangle and took it as a chance to get to know the topology in depth. Each individual match result has a dedicated wager address. Winnings are payed automatically to the active IOTA receiving address by following the individual transfer’s remainder address up the tangle. This makes the application super easy for the users, no registration, no donation. 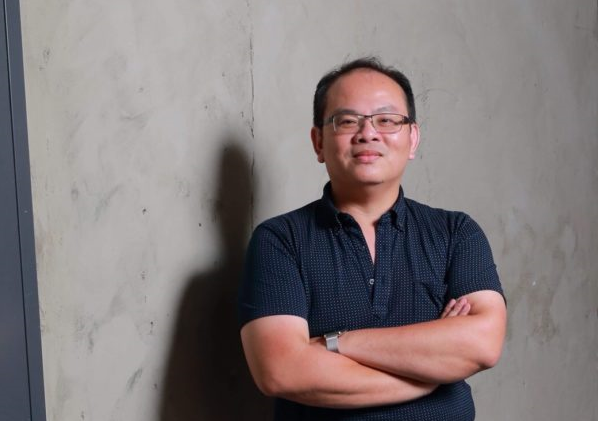 The operators said they tested the payouts in great depth which caused some delay but they are glad that they made it before the world cup’s final match. There are already bets with 0,5 MIOTA possible. User can anonymously place a bet by transfering IOTA tokens to a distinct betting address on the Tangle by using the Trinity Wallet. The bet is then uniquely associated with the sending address. But user cannot bet from exchanges since there is not a unique receiving address. Betting is against the loosing bidders, not the operators. The odds are dynamic and change with the pots‘ size. It is very interesting to look at the odds even if you do not bet. Bidding for each match closes with kick off time, the address disappears 10 minutes prior. The transaction’s timestamp is relevant. Winnings are transfered back to the IOTA account by tracing the active IOTA receiving address. The operators do this by following the remainder address up the Tangle. The operators take a fee of 2% of the pot for infrastructure and efforts. The Bid is only possible with a personal IOTA wallet, e.g. Trinity or CarrIOTA Romero wallet. How do user receive winnings? If the trinity wallet is used and a remainder is left in the wallet, there is nothing to do but wait. Each transaction gets wrapped in a bundle which adds additional logic to the transaction. The key for the payout system is the very last transaction uniquely identified by its index inside the bundle, called the remainder address. The unspent amount (input minus transaction amount) is transferred to that address, the operators promised. The company verifies that WINiota is the first decentralized on-Tangle provably fair Casino & Sportsbetting platform. But there are also voices that are critical of the WINIota project. We will analyze this project intensively in the coming weeks. According to the schedule on the web site, Winiota intends to start services in July 2018. That’s why we’re introducing this here. A detailed description of the concept is given in the so-called whitepaper on the website. We have reproduced some of the most important statements of the white paper in the following section. The Whitepaper says:“ Online gambling is very popular in the fast paced digital world today, with the market volume of online gambling forecasted to reach 51.96 billion U.S. dollars in 2018, more than doubling since 2009. People can play in the comfort of their own homes or offices and can replicate much of the gaming excitement found from playing in traditional casinos, but the online gaming industry has many issues that directly/indirectly originate from the basis of trust. These issues can be anything from the algorithm in random number generators to the management of users’ balance account. Also, if we take a look at the counterparts such as BitDice and Nitrogen Short which are operating on the Ethereum Blockchain, you will see that heavy traffic takes a toll on their operations and also, the users are handicapped by the transactional fees which may take away the immersion of their gaming excitement. WINiota is addressing the issue of trust and scalability by implementing the provably fair mechanism to all games, inclusive of the sportsbooks, by facilitating IOTA’s tangle, a directed acyclic graph (DAG) for storing transactions in the network. Player will be able to “take a look under the hood” at all times; Now users can see everything: transactions, bets, and most importantly, the mechanism of “Provably Fair”. WINiota says casino & betting platform are distributed fairly. Online gambling platforms today are plagued with controversial issues: The opaque mechanism and inefficient transaction procedures. Most importantly, there is simply no way of knowing what is happening inside the casino’s servers and how the mechanisms are programmed. There is often an air of mistrust and most people have the impression that online gambling is rigged to disfavour the players unethically. In this scenario, players need to rely on trusting the casino, However, like any other business, online gambling has a business model in place designed to ensure its profitability, so ‘trusting the casino’ to act in your favour is not the most ideal approach. Most online gambling operators have set forth their own rules concerning payments, including deposit and withdrawal limits, verification procedures, accepted currencies, fees, and processing time-frames. Withdrawal are often charged to players at an exorbitant rate and they are often a tedious procedure. Collecting what you have earned while betting online should be just as simple as depositing but unfortunately, the process is not as instantaneous. To submit a withdrawal request, players need to select a withdrawal method they intend to use, input their banking details and confirm the amount they want to cash out. The withdrawals will take some time as the casino needs to verify the request in order to ensure the player is indeed eligible for a cash-out. Overall, the gambling experience is tedious as the general idea of these barriers to withdrawal is to keep players in the gambling so as to profit the operators further. Often, players return during the wait time to gamble further, and this is in favour of the operators due to the idea of house edge. These unfriendly features associated with the withdrawal procedures will be largely mitigated by the beauty of Tangle network. Simply put, there will be no hot wallet on the WINIota platform as Tangle allows the establishment of a flash channel that facilitates the flow of stakes Gambling with WINiota cannot be anymore efficient and WINIOTA owe it all to the beauty of IOTA’s Tangle network. Moving on, to introduce the concept of house edge: the odds advantage in its favor which represents the average gross profit the casino can reliably expect to make from each game. On the games with the lowest house edge, the smallest advantage, a casino might only be generating about a 1 to 2% profit. On other games, it may make profits of up to 15 to 25% or more. House edge is considerably fair in general; casinos are business and business are run with the idea to profit in return of a service, which in this case is to provide entertainment to the players. However, on certain occasion, it is possible for house edge to be rigged to favour the odds of the house even further, especially if the gambling mechanism is digitalised. The pills in digital roulette do not obey the law of physics, rather, they behave as told by the strings of code driving them around the pixelated roulette. WinIOTA cannot rule out the possibility of rigged odds until they can fully see the mechanism behind the calculation of outcomes in online gambling games. Over the next few weeks and months, public IOTA will keep an eye on the IOTA application WINIota and in particular will report on how things are going to continue and how the white paper’s goals are being implemented. But we will also pursue the voices that believe that WINIota is not a project based on top of the Tangle. During the process of creating the health care chatbot Florence, we found out that we can’t use the technology to its full potential due to various problems with the current state of the healthcare system. You as a patient should be in control of your healthcare data and a chatbot should support the private, secure and continuous communication between you and your healthcare provider network. However, with the current technology that isn’t possible. That is why we started to experiment with Iota. So, we have a huge interest in improving the technology for sharing data with the help of the tangle. 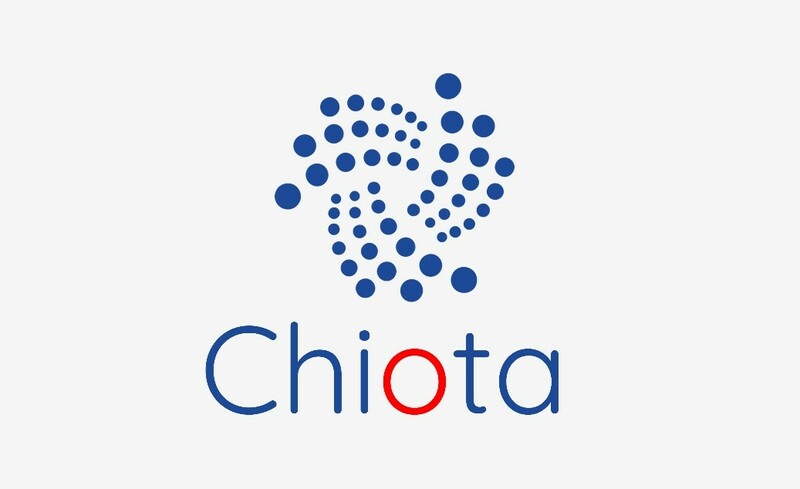 Chiota is an IOTA Xamarin Chat App based on Felandils C# .NET Port of the IOTA lib, who also helped with this app, Steppenwolfe65 NTRU-NET and jamesmontemagnos MonkeyChat. The goal is to create a quantum secure chat app, in which you are the owner of your own data and nobody else! 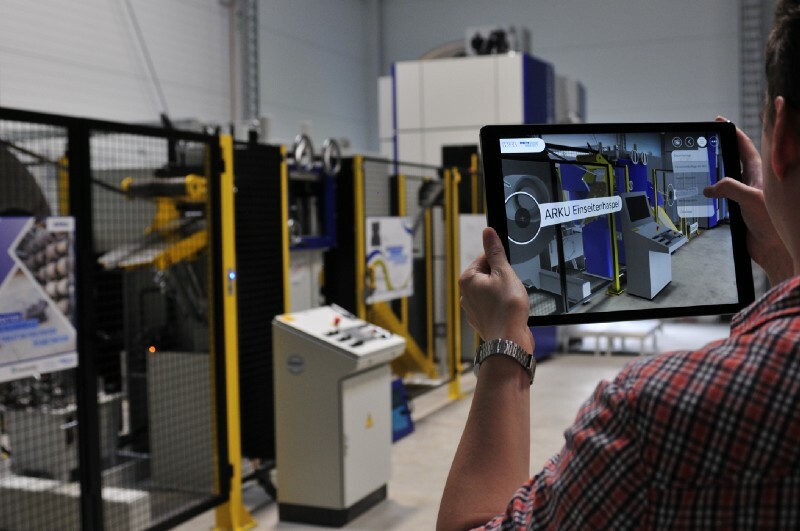 The Laboratory for Machine Tools and Production Engineering (WZL) of RWTH Aachen University is currently researching the “Internet of Production” — the core of the Industrial Internet of Things, which paves the way for a future era of production. A few weeks ago, the chief engineer of WZL’s Chair for Manufacturing Technology, Dr.-Ing. Daniel Trauth, spoke with Markus Gebhardt from the „public IOTA Project“ on the processes and visions in the use of IOTA in fineblanking. It was also agreed that the „public IOTA Project“ would continue to flank this process of the real IOTA application in the future. Due to the progressive digitization of all areas of life — above all communication, science and the internet — countless data is generated every day, especially measurements in advanced industrial processes create a flood of data. Dealing with this Big Data is an important step towards Industry 4.0 and the Internet of Things. Specifically, the WZL of RWTH Aachen University is currently working on the application of a fineblanking machine. In fineblanking, firstly the metal is decoiled from a sheet metal coil. Afterwards, the decoiled material is fed into a straightening system, where the sheet is flattened. A fineblanking press then processes the flattened material. Up to four parts a seconds are cut-out from the flattened material. Fineblanking is very suited for mass production of security-critical components, such as brake carriers. The goal is that all parts are identical. However, this is not the case, since uncertainties in the material, the process, or even the surrounding area result in different die-rolls and clean-cuts. However, since all parts have to be identical at the end, it requires expensive post-processing steps, which one ideally wants to avoid. Engineers have tried to describe these relationships in formulas of certain process parameters, but they contain constants that have to be determined experimentally. Therefore, the approach is to capture as much data as possible from the process and to combine physical-based and data-driven approaches for the first time in fineblanking. 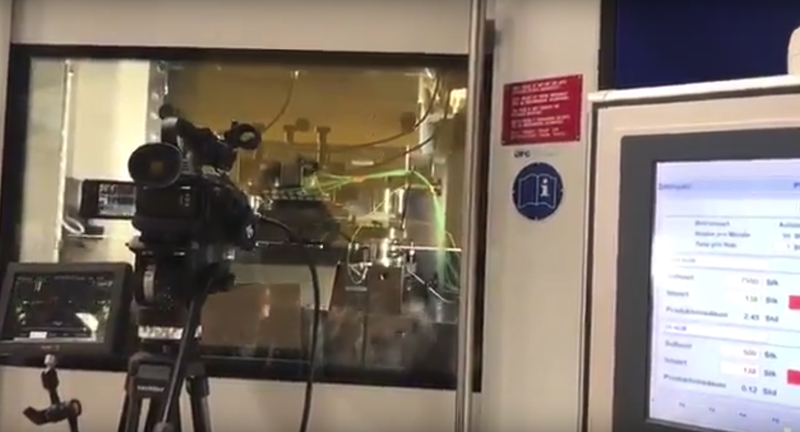 The data is read directly from the machine, from additional self-attached force sensors, image and video feeds, material property sensor (a sheet is never uniform) or acoustics, vibration, temperature sensors. This leads to data rates of up to 10 Gbit / s (theoretical), of which the WZL wants to save as much data as possible in a first step. They have a server with plenty of power and memory in their machine so they can store that data and then manipulate it with machine learning methods. The aim is to find new correlations between individual measurement series and the perturbation parameters that are hidden in the formulas in the constants. The vision then sees a self-governing, ‘autonomous’ machine, which controls itself as in “autonomous driving” and optimizes the process. This case alone already includes several construction sites (data acquisition, data integration, distributed networks, generally much of the field of “big data” and machine learning), but the WZL now wants to devote itself to the distributed ledger technologies such as tangle and blockchain and in the form of a testing out the digital supply chain. In this context, a digital value chain, which is now being used with IOTA, is presented in such a way that process states, production steps and component properties are digitally mapped in a networked value chain for every component produced by the fineblanking machine. With the ability of DLTs to be unalterable, and the ability to pay for IOTA’s unique data streams / data sets, IOTA’s Tangle provides a promising basis for a digital connected value chain. 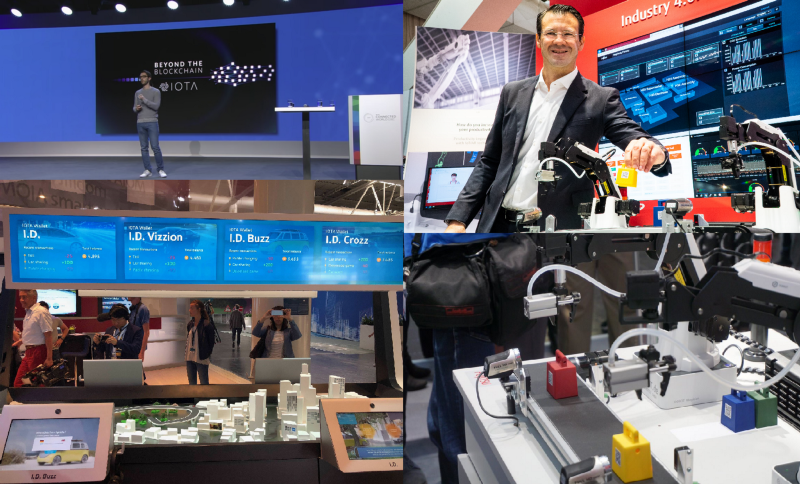 We read it recently in the press: In future, the WZL will rely on cooperation with grandcentrix, one of the most modern system houses specialized in Internet of Things productions and smart products in the region. As a cooperation partner, grandcentrix is certainly a great choice and is to be welcomed in any case. This cooperation should make it possible to realize the vision of the Internet of Production with the know-how and the methods of an expert in this field with a unique position to provide services end-to-end, from electronics design to the cloud and digital ledgers. grandcentrix’ Managing Partner Ralf Rottmann recently joined the IOTA Foundation’s Board of Directors which further gives the team direct access to the IOTA universe. The previous, very good exchange between the WZL and the „public IOTA Project“ should be continued and deepened in the future. public IOTA will continue to flank this extraordinary process of implementing this IOTA application in machine tool manufacturing. 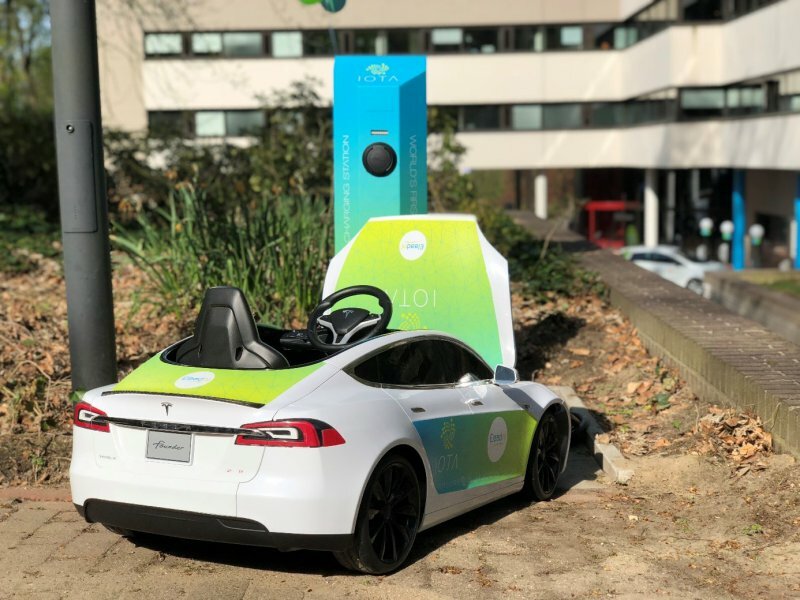 Harm van den Brink, innovator at ElaadNL and Enexis is charging a mini Telsa on the IOTA charging station at the ElaadNL test site in Arnhem, the Netherlands.